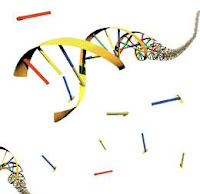 A synthetic molecule can reshuffle itself to match a DNA template. Chemists in the United States have made an artificial DNA-like molecule that can change its sequence to bind to a DNA template without the help of enzymes. The findings could shed light on how molecules underpinning life were first able to emerge from a chemical soup. Shapiro says, however, that Ghadiri and colleagues' method is an elegant piece of chemistry, and sees its potential especially in the field of synthetic biology. "More needs to be done to show that [Ghadiri's] system can function as a gene. If it can, then it would be a candidate for service as the genetic component in current efforts to construct a cell artificially," he says. The vexing question of how strands of DNA or RNA might have first formed has led many chemists to try and recreate the situation in the lab, using synthetic molecules that stack together to form DNA-like strands. Now, Reza Ghadiri at the Scripps Research Institute in La Jolla, California, has taken a different tack — coming up with a molecule that can pair up with different sequences of DNA by rearranging its own sequence.